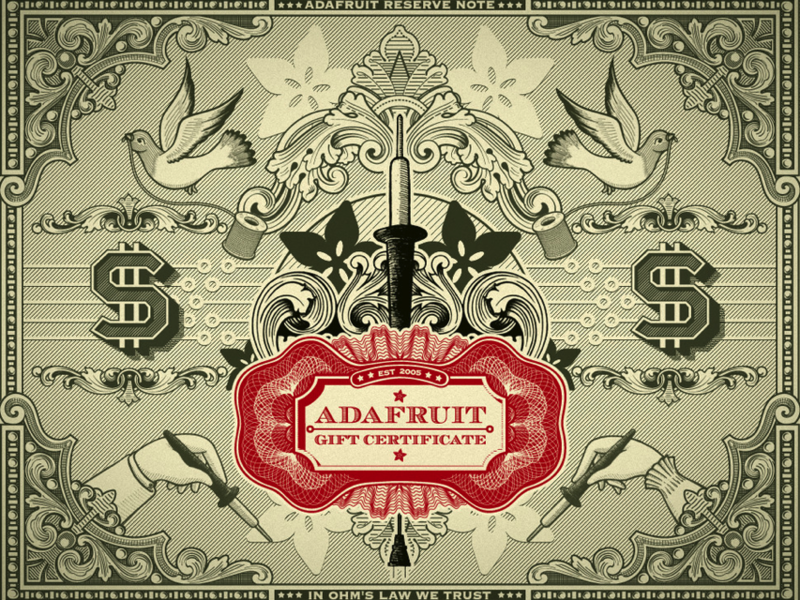 Adafruit gift certificates are the perfect last minute gift! « Adafruit Industries – Makers, hackers, artists, designers and engineers! Adafruit gift certificates are the perfect last minute gift! Know someone who loves electronics but don’t know the difference between an XBee, a soldering iron, and a SMA to uFL/u.FL/IPX/IPEX RF Adapter Cable? Want to buy the perfect gift but don’t know whether your Maker friend is a BeagleBone fan or a Rasp Pi devotee? Just a fan of Bruce Yan’s incredible design? If you’re any of these, or more, buy an Adafruit Gift Certificate – the perfect cyber-present for the electronics geek in your life. Pick one up here and find out more about how to give and receive gift certificates here! Comments Off on Adafruit gift certificates are the perfect last minute gift!